Sichuan is one of China’s most inaccessible provinces, though ironically it is also one of the most populated, with over 87 million people. Known as the Land of Abundance, this historic province contains three World Heritage Sites: Mount Emeishan, Huang Long Valley and Jiuzhaigou. One of China’s four sacred Buddhist Mountains, Mount Emeishan is blanketed in a lush forest of green bamboo. It has over a hundred monasteries, and attracts both pilgrims and mountain-climbers looking to scale its heights. Aside from its magnificent cliffs, Mount Emeishan also has tall trees, fragrant blooms, fresh springs and powerful waterfalls. Huang Long Valley is an unrivalled scenic area full of sparkling lakes, roaring waterfalls, snow peaks and quaint Tibetan folk villages nestled in a carpet of verdant forest. 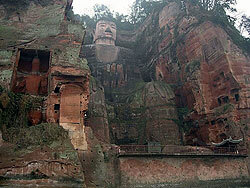 Nearby, on Lingyun Mountain, is the Leshan Giant Buddha, an enormous statue carved into the mountainside, which stands 71 metres tall and is wide enough to allow over a hundred people to sit between its two feet. The national park of Jiuzhaigou encompasses nine Tibetan villages in a stunning valley. The area is cloaked in green forests, and has over a hundred glittering lakes, plus snow capped mountains. One cannot be in the area and not stop by Sichuan’s capital, Chengdu. This ancient city is famous for its intricate brocades, rich satins and opulent lacquer. Chengdu was one of the very first centres of printing in China. It is also home to one of the world’s foremost centres for conserving the giant panda, the Chengdu Giant Panda Research Base and China Panda City. Sichuan has one of China’s eight great cuisines. Its rich hot dishes waft in pungent and spicy flavours, due to the liberal use of garlic, chili and red hot peppers. Popular choices on the menu are Mapo Dofu, Twice Cooked Pork, Kung Pao Chicken, Smoked Duck and of course, the famous Sichuanese Hot Pot.